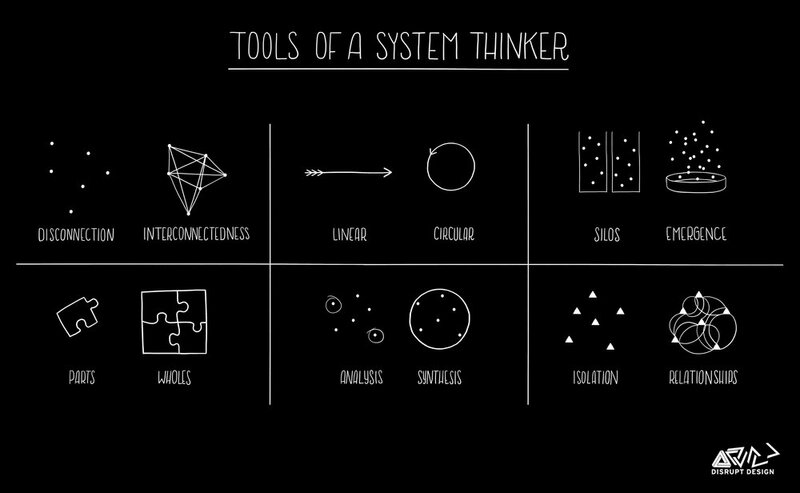 Systems thinking is one of the most powerful tools we have to understand and change the world around us. The original application of systems thinking in organizational management and change started to evolve in the 90’s, with the need to reconfigure efficiency and productivity within organizations. Today, many industries leverage the power of systems thinking, from healthcare to advanced technological applications. Redesigning how we can sustainably deliver products and services also requires a systems thinking approach. This ensures that we meet human needs without negatively impacting the natural systems that sustain life on Earth. Organizations employing a systems approach to sustainability and organizational change gain a more evolved understanding of how things are interconnected. This helps develop creative, divergent, and effective ways to rapidly build solutions that have positive impacts. Optimization: With a deeper understanding of the dynamics within a system, optimization is an emergent outcome of systems thinking. It allows organizations and individuals to take full advantage of any element within their system. Problem Loving: Rather than avoiding complexity, systems thinking helps individuals discover the exciting opportunities that problems offer for innovation and creative development. Employees become problem lovers, not problem avoiders. 3-Dimensional Perspective: A systems approach looks at the whole organism or ecosystem, not the individual parts. This means moving beyond the siloed ‘departments’ and developing a trans-disciplinary understanding of the macro and micro in an interconnected, dynamic way. The world is not flat – developing a wholistic systems view unlocks the power of creativity. From Linear to Circular: Human-produced systems are largely linear. We take things from nature, manufacture them into usable goods, and then dispose of them back into holes from where resources were extracted. This approach is reductive and inefficient. A systems approach allows for the circularizing of all products and services so that we design out waste and inefficiencies, plus create more value. Failure is Fun: Since there is no blame in a system and everything is interconnected, systems thinkers get excited about discovery. This is especially true when it's learned through ‘failure,’ as it helps gain new perspectives that build our creative capacity. Interconnectivity: Everything in nature is dynamically interconnected and interdependent, just as humans need each other for success. Creativity and productivity depend on interconnectivity, and systems thinking provides the tools to integrate this into everyday practices. Creativity: The more you develop a dynamic understanding of the world, the more creativity your brain starts to develop. Conformity kills creativity; to overcome this crisis, systems thinking activates new neurological development and enables dynamic, divergent thinking. In order to maximize productivity in a positive and regenerative way, we need to shift mindsets from a mechanical worldview to one of dynamic, creative, interconnected systems worldviews. We need to apply our past knowledge of the evolution of the natural sciences to our organization and production processes and systems of today. Creativity pioneer Edward de Bono argues that possibility is what makes a beautiful creative mind. In his work, he illustrates how the mind uses experiences to map and pattern thoughts. It shows significant insights into the way humans can bust through linear thinking into lateral, divergent, and disruptive thinking modes. For de Bono, creativity stems from being open to provocation. Stagnation of ideas come through the repetition of the same experiences and thus comfort is a killer of creativity. How often does your organization seek out provocative new experiences that challenges the status quo so that your creativity can be enhanced through positive challenges? Systems thinking, with all its different offshoots and branches, evolved to help humans understand how to be more effective and creative as communities, as collaborators with nature, and as contributors to the future. Knowledge, meaning, and purpose are understood through the building up of ‘whole pictures’ of phenomena rather than the breaking down of things into parts. By adopting a creative systems worldview, we shift our mindsets to look for interrelationships within and between systems. When looking to increase efficiency, productivity, and creativity, organizations need to think about the untapped knowledge that exists in the deeper worldviews that people hold. This helps overcome natural cognitive biases and unlock the creative potential of their human resources. This will help us learn how to build regenerative businesses that give back, rather than take away from the planet.